Are you planning an adventurous kayaking trip? Or are you simply going for a leisurely afternoon paddle in a nearby pond? It doesn’t really matter what you’re up to, whenever you take your kayak out onto the water, there’s nothing as important as kayak safety. If you’re interested in learning more about how to stay safe while kayaking, you’ve arrived at the right place. Here at The Adventure Junkies, we’re dedicated to offering our readers all kinds of useful information and tips. In this article, you’ll learn basic kayak safety. 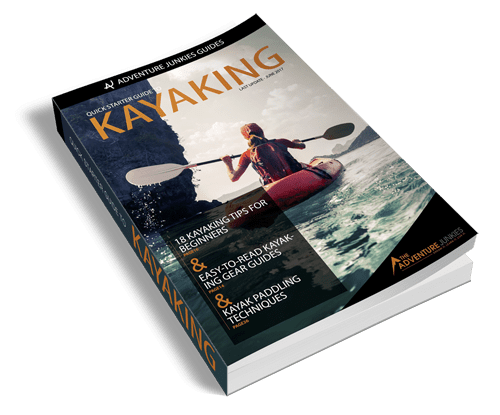 CLICK HERE to Download our FREE Quick Starter Guide to Kayaking. Injuries can occur when kayaking, and even drowning is a real risk, especially if you’re trying to conquer rapids. That said, the chances that you’ll actually get hurt during a kayaking outing are pretty low. Safety is always a concern, though. As Paddling.com says, you’re dealing with water and if things do go wrong, they can go wrong very quickly and very badly. 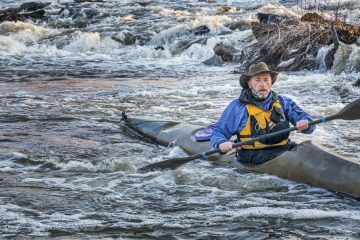 Because of this reason, it’s critical that you understand and are aware of the hazards and risks that come with kayaking. Expect the best, prepare for the worst. On the water, you should always have a conservative attitude toward everything you do. 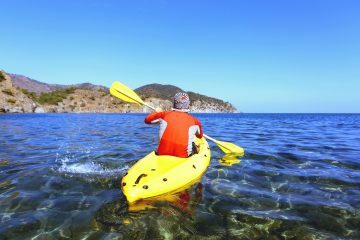 By following the kayak safety tips below, you’ll drastically reduce the chance of getting hurt while paddling. 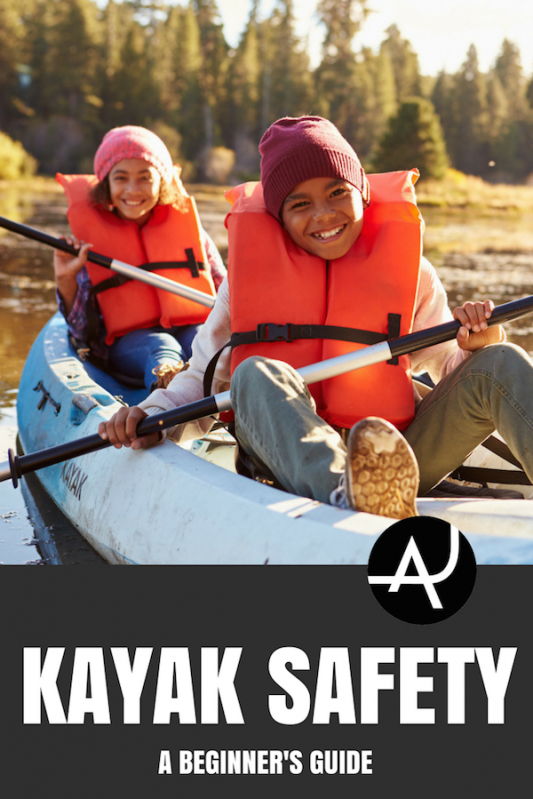 According to The American Canoe Association, 48% of all kayak fatalities are due to not wearing a life jacket. With regards to canoeing, that percentage is a remarkably high at 85%. This means that you can cut your risk of dying when kayaking in half simply by wearing a life jacket. This is without question the most important kayak safety tip we can give you. If you find that wearing a life jacket is uncomfortable when paddling, consider purchasing a kayaking specific life jacket, or PFD. Those are designed specifically to be less restricting and to allow for greater range of movement. Remember that it’s better to overdress than to be too cold. Check the weather forecast before you go. Even checking the water temperature is a good idea. Better safe than sorry, right? Be prepared for sudden changes in the weather. If kayaking in colder weather, wearing a wet or dry suit does a great job at keeping you warm, even if you fall into the water. On sunny days, consider wearing long sleeves and a hat to protect your skin from the sun. It’s important to invest in appropriate kayaking clothes. Your own safety depends on them. If rain is expected, bring a rain jacket and stay warm by wearing wool or synthetic thermal base layers. Also, be aware of local wind patterns. Off-shore winds may make it difficult to get back on shore. Make sure that you know the local boating rules. If you’re the only person boating, you’re in luck for two reasons. You’ll be able to enjoy your surroundings in peace and solitude, and you won’t have to pay attention to other watercraft. If you’re not alone, though, there are a few things you should take into account. It’s important to “see and be seen”. Wear bright clothing, use reflective tapes on your paddles, keep a whistle within easy reach. This is especially important if you’re kayaking in busy waters that have motorized boat traffic. If they’re present, check what the colors of buoys mean. Be aware of the rules of the road—essentially traffic rules on waterways. 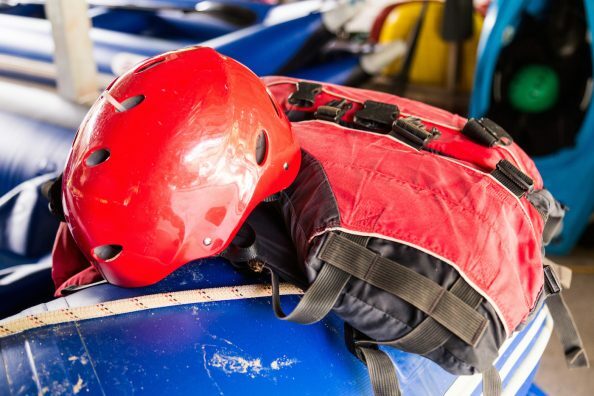 If you’re kayaking rougher water, such as fast-flowing rivers and rapids, it’s a solid idea to wear a helmet. In places, you might even be required to wear a helmet when boating. Depending on your skill level, experience, abilities and ambitions, the most suitable kayaking location will vary. However, every great kayaking location has plenty of spots to go ashore, easy launching access and low boat traffic. Always start off in shallow water, in calm bays or quiet lakes or rivers. Once you improve your skills and gain confidence, you can move to less stable waters, such as rivers with waves and windy lakes. Don’t be overconfident, though! It’s important to know your limits. Alcohol, and physical exercise and mental awareness don’t go together. Don’t drink any alcohol (or do drugs) when you’re on the water. On-shore, after setting up camp, having a beer while watching the sunset is, of course, okay. This is a critical kayak safety tip. You will already know how to get in a kayak and out again. Getting back in a kayak after falling into the water, however, is a whole other ball game. Make sure to practice re-entering from the water before you go. If you flip over, it can be a challenge to turn over your kayak, empty it out and climb back in. Before going on a serious kayaking trip, spend some time in a shallow spot on a quiet lake practicing your re-entering skills. Before you head out, tell someone—a relative or friend—about your kayaking plans. This includes your location, your itinerary, your planned camping spots, how long you think you’ll be gone and how many people are in your group. Then, obviously, it’s essential that you stick to that plan. Cold water safety is extremely important with regards to kayaking. Cold water is dangerous, period. It impairs your judgment, reduces coordination and decreases your muscle strength. Even immersion in 50-60-degree water can cause so-called cold water shock. Falling in cold water can make you incapacitated within mere minutes. This is also why it’s vital to wear a life jacket. You may literally not be able to swim in cold water. If you’re kayaking on water that’s colder than 60°F, wearing a wetsuit is a must and wearing a dry suit is recommended. 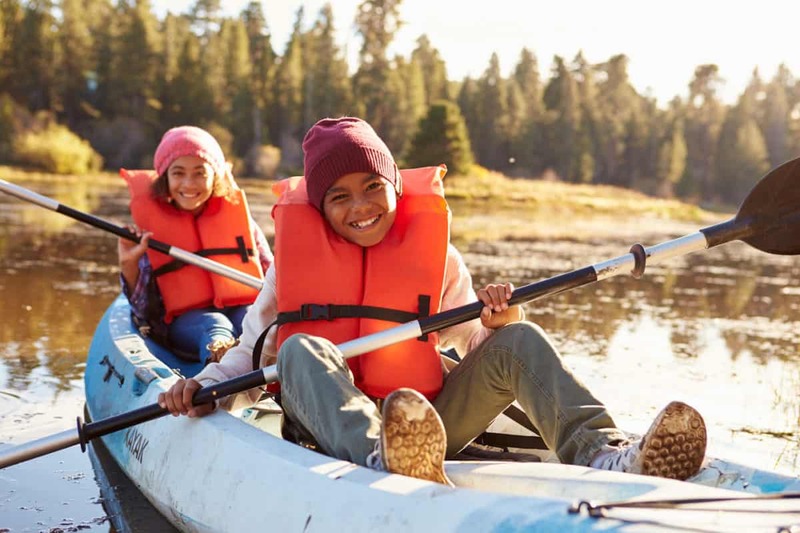 You can learn the basics of cold water safety in this document from the American Canoe Association. 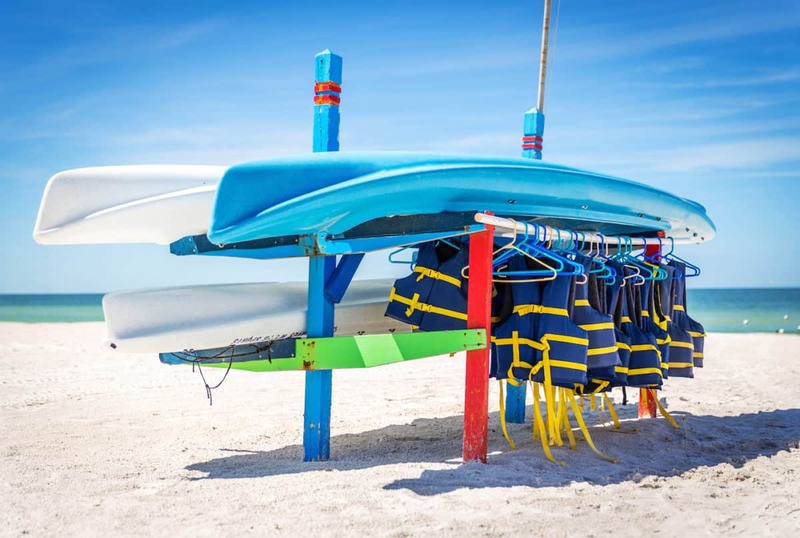 Unless your kayak and equipment are brand new, it’s wise to check everything for wear and tear before you head out. Ensuring that everything works like it should will only make your kayaking outing safer. Born in Belgium, Bram Reusen is a travel writer, photographer, craft beer lover and hiking expert based in Charlottesville, Virginia. From morning hiking trips to multi-month cycling adventures, he has plenty of experience venturing into the wilds of the world. He’s explored 28 national parks and visited 45 UNESCO World Heritage Sites. Do you want to save money on Kayaking gear? 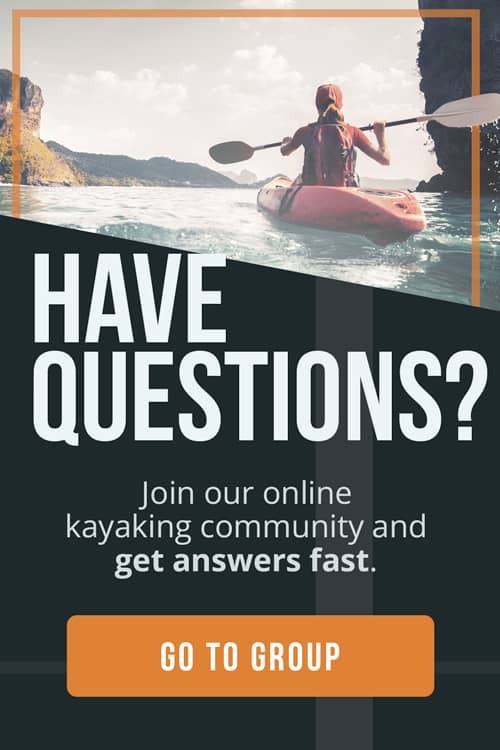 Enter your name and email to get instant access to the Quick Starter Guide to Kayaking, which has been used by tens of thousands of people to plan and prepare for their paddling adventures! Plus, you'll get exclusive content in our newsletter to help you make the most of your time on the water! Along with the guide, you'll get exclusive content in our newsletter to help you make the most of your time on the water!